I got a very nice email from a guy today who wrote to me about finding "13th Track radio years ago and every October since I've listened to Dark Ride. It's become a tradition." He went on to write, "That first year it was my mom and me and my sister. 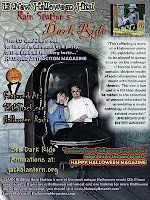 Since then my mom has passed away...and my sister passed away...13Track/Dark Ride is an old friend and it brings me a lot of memories of my family listening over the computer speakers and handing out candy to trick or treaters or printing out decorations to scotch tape to the windows of the house." It really touches me that the little Halloween record that Jay and I banged out over a two week period back in 2000 is part of folks Halloween traditions. Thank you to the person who sent me this email...and thank you to all who listen and support independent music.